Complete Hydraulic Service helps you extend the life of your equipment. Our salvage parts recycling and retooling work or manufactured parts can bring your parts to OEM specs. Even completely rusted out and worn parts can be rebuilt and retooled. With Complete Hydraulic Service precision machining service, we can modify Cat quick coupler hooks to meet Caterpillar specifications which will correct loosening work tools. 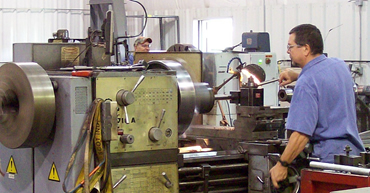 Using our large horizontal boring outfitted with dedicated tooling, our trained machinists provide a reliable repair.